New Delhi: Government passed a flagship policy on Tuesday to encourage manufacturing by streamlining labour and environmental rules in industrial parks, a move it says is key to create jobs and keep Asia’s third-largest economy on a fast-growth track. Business leaders welcomed the news, which will be a boost for Prime Minister Manmohan Singh, whose second-term agenda of big-ticket economic reforms has been knocked off course by corruption scandals and a lack of clear leadership. With an eye to its emerging market rival China, India is desperate to ramp up goods exports and revamp a manufacturing sector that has struggled to be competitive since before economic liberalisation in 1991. India’s economic boom has seen average economic growth of over 8% annually in recent years but job creation has been very low — worrying for a country which needs to absorb about 20 million new workers each year. 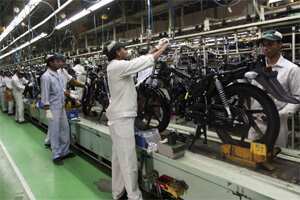 Sharma said the new policy sought to create 100 million new jobs within a decade. In the same period, the government aims to lift manufacturing’s share in gross domestic product to 25 from about 16% now, the level at which it has stagnated for more than 30 years. The plan to slash regulation in at least seven special zones in the notoriously bureaucratic country has been in the works since last year but was held up by objections from the labour ministry, under fire from unions. Dipanker Mukherjee, general secretary of the Centre of Indian Trade Unions, said the new policy was created without consulting workers and would be opposed “lock, stock and barrel" if it did not protect workers’ rights. But Confederation of Indian Industry said the new policy will “revolutionize" the manufacturing sector in the country and will help India head off a global economic slowdown. “The announcement of the policy at this critical time would generate momentum, resulting in long term positive impact on growth aspirations," the industry lobby group’s chief Chandrajit Banerjee said in a statement. The zones will be developed by the federal and state governments along with the private sector to provide infrastructure such as ports and airports as well as freeing up labour rules — including easing regulations on wage payouts if a company closes. Sharma also said the use of green technology would be encouraged with incentives.